Apotheosis isn’t a subject that came up spontaneously in my own study and practice; it was an idea I encountered specifically from Hellenic polytheists and from people who (like myself) count members of this community among our friends. I recognized the stories cited as apotheosis narratives but I had little investment in them as sources of emotional or spiritual guidance. That is, not until I remembered that I did in fact have an apotheosis narrative that I did hold dear to my heart: the story of Andal. 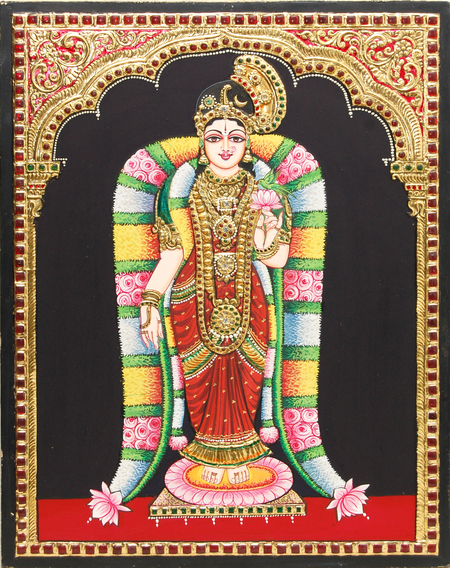 Andal (sometimes spelled Antal) is a goddess from the Tamil Hindu tradition but the stories we know about her are specifically about her life as a human being. Of the many reasons she is celebrated, the fact of her physical, embodied human existence is one of the most endearing and enduring. I held onto this story as an example of sacred marriage and as an example of the mortal spouse ending up with a retinue of spirits that regarded her as a queen. It’s also a very sweet love story that deserves a wider audience. Eventually Kodhai’s father discovered what she was doing and reprimanded her. That night, Vishnu himself appeared to the garland maker in a dream, saying that the garlands offered from Kodhai’s very own body were even more precious to him. Chastised by the god of the temple, the garland maker allowed Kodhai to continue her idiosyncratic worship. Andal’s mortal life included the composition of the Tiruppavai and the Nachiar Tirumozhi. The Tiruppavai in particular is still highly popular and annual recitations of the work are common in Tamil-language regions of India. The marriage ceremony initiated by Andal’s gift of the garland culminated with a formal wedding. She had dreams of Vishnu, including one charming account wherein all the many, many forms of Vishnu bickered with one another to determine which of them she would choose to marry. 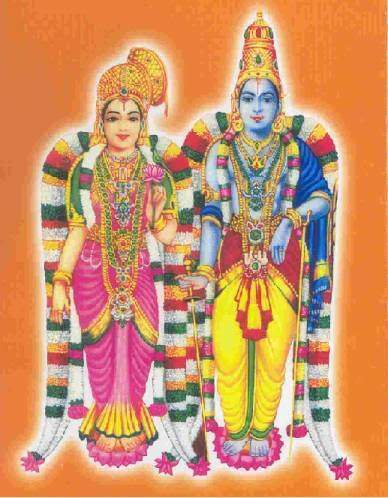 (She ended up marrying the form of Vishnu specifically identified with the temple her garlands were offered at.) At the very end of her story, Andal passes from a strictly human sphere into one inhabited by spirits, who now regard her as a queen. Her narrative fades at this point and she becomes fixed in the heavenly realm as the deified mortal bride of the Lord of the Three Worlds. Sri Andal and Mirabai are often spoken of in the same breath. Both are mortal women with a historic reality; both composed emotive and intimate songs of praise and longing in their regional languages. Both are now celebrated in the regions they came from and far beyond. Both loved and lived in a Vaishnava context. Both regarded a god as their one and only husband and both chose that husband according to their own desires. And interestingly, both of their stories essentially come to a halt at the end of their lives. (I wouldn’t be surprised if there are stories about Andal’s actions as a goddess or about her intercession on behalf of worshipers; I’m simply not aware of any. Similarly, Mira’s identity as a saint is based on her life narrative and not on any particular supernatural healings or interventions attributed to her after her passing.) However, Andal has become a goddess while Mira has remained fixed in the human realm. Mira is remembered for her passion and for her devotion against all odds; Andal is remembered for her marriage and apotheosis. Mira is a princess that became a wandering saint; Andal started life as the daughter of a tradesman and became a divine queen. I’m not able to solve the mystery of apotheosis. I don’t have a convenient way to explain why two stories with so many similarities have such radically different outcomes. Perhaps a clue exists in the way that these women’s assertions were regarded by others. Mira encountered continual conflict with her extended family and because of her social position; Kodhai’s father eventually came to believe her and helped her express her sacred relationship in ways meaningful to their immediate community. Kodhai’s story also includes various levels of divine intervention that aren’t as evident in Mira’s. Miracles are credited to Krishna when he saved Mira from poison and from a snake, but I can’t recall a narrative that has him talking to other people on her behalf. I rather wonder if apotheosis is a solution to a problem that we as humans aren’t quite able to see. The ascension of a new divinity doesn’t involve the overthrow of an old one; if anything, it fleshes out the landscape of divinity to meet varying needs of humanity. It’s entirely possible that we as a species had some spiritual need for one of our own among the High Ones; Ariadne and Andal and others might have just been right for the job. That said, I personally find more succor from visage of Mirabai, who had so few fucks to give for anything that wasn’t her lord than I do from Andal and her court of spirits. I am charmed and deeply touched by the idea of many Vishnus arguing over who gets to marry Andal, but I am in awe of Mira’s plaintive sacrifices. Recently, I have been doing an in-depth study of apotheosis. For the Hellenic Pagan (and possibly for others, though I would not know), apotheosis is an interesting topic because it can help us to understand that difference between humans and deities. It is also an extremely difficult concept to tackle from the perspective of Hellenic theology, because the implications of it are difficult to think about. Difficult Concept 1: Gods are people, and People aren’t so different from gods.